The Gearmarshal spawns outside the Mechanotus courtyard. Looks like a steamwork mob that you find in abundance throughout the zone, but is a bit bigger and colored red. This page last modified 2008-02-11 10:23:58. A Harconis scowls at you ready to ressurrect -- what would you like your percentage to be? Found him roaming around near the Goo's. CLR, SHM, MAG (all 80)put him down. Earth pet tanked. His 1 buddy seemed to be leashed to him, we tried to CoH split, but add always seemed to return. Pulled to safe spot, sent in earth pet, SHM slowed named & add, CLR spam healed pet. All was going smooth until Gearmarshal enraged, he popped pet at 4%, summoned & killed MAG; however CLR & SHM were able to nuke and finish him off. His add aggro'ed SHM which ran away, CLR rez'ed MAG back in, who then CoH'ed SHM out of harms way. Was a very fun fight, and great challenge for the 3 of us. Dropped All-Purpose Longwrench. Hit our 77 pally (18.4k / 3225 ac) today max for 3085. Flurries. No rampage at all, especially not AE. Does not quad but he flurries occasionally. warrior listed hardest hit as 2954. It looks like this mob may have been adjusted to be tougher after the last patch. 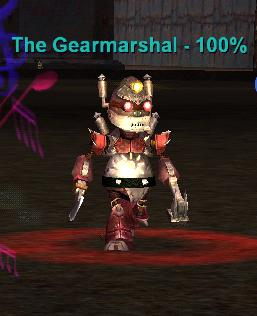 The Gearmarshal had two steamwork menders escorting it and it nailed me for for 6k right at the start of the fight. With the adjustment to the Tinmyn's Oil Can charm quest, it looks like this and other mobs in the zone have been toughened up a bit (ie - Cog Marauders). Had him drop melee shoulders for us tonight. Also as an update, he never ae ramped during the fight. Took about 1 and a half minutes for us to down him. He flurried twice during the fight, and did enrage at end. Other than that, nothing else. What caster is going to equip this 2HB when there are easily-groupable or -questable one-hander/shield combos with combined better stats. Lousy reward for fighting a mob this tough. Quadded me for a max of 4400 at 3800ac/full shielding (buffed). The others in my group were hit a little harder, so I'm assuming this thing is a 5k hitter. I think he ae rampaged also. He looked like one of those steamwork robots that you see throughout the zone, except he was painted red and was a little bigger. Don't feel bad... I was sititng at 20.4K HP 3.9K A/C with full Shielding and he One rounded me before I managed to click furious disc. Ranger said he couldn't land a snare or root on it either... so not sure how other classes are snaring it. But definetely makes you feel un-ubber when you get one rounded like that, I tank Demi Mobs like they are Toys.